Video games are a big part of both boys’ and girls’ lives and they can be a very positive experience for kids and families. As with other media, it’s important for parents to be involved in their children’s video gaming and be aware of the different issues that children and teens encounter while playing. 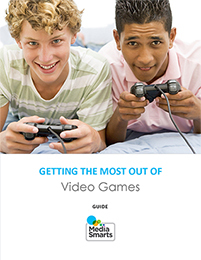 This guide provides information on video game ratings, ways to pick good video games for your children, tools for avoiding unexpected charges and tips for managing video games in the home.